Edible pumpkin flowers, edible pumpkin leaves, edible pumpkin flesh… If you’re trying to figure out what parts of a pumpkin are edible or just want to know how to eat your Halloween pumpkin, you’re in the right place! One of the many benefits of growing your own pumpkins instead of buying canned pumpkin from the grocery store, is that you can eat every part of the plant. Pumpkin flowers, leaves, stems, seeds, and flesh (including pumpkin skin) are all edible. Why else would you grow your own pumpkins? You might enjoy growing unusual heirloom varieties of pumpkins for their unique characteristics. Left: Long Island Cheese pumpkin (ideal for pumpkin pie, pumpkin pudding, etc.). 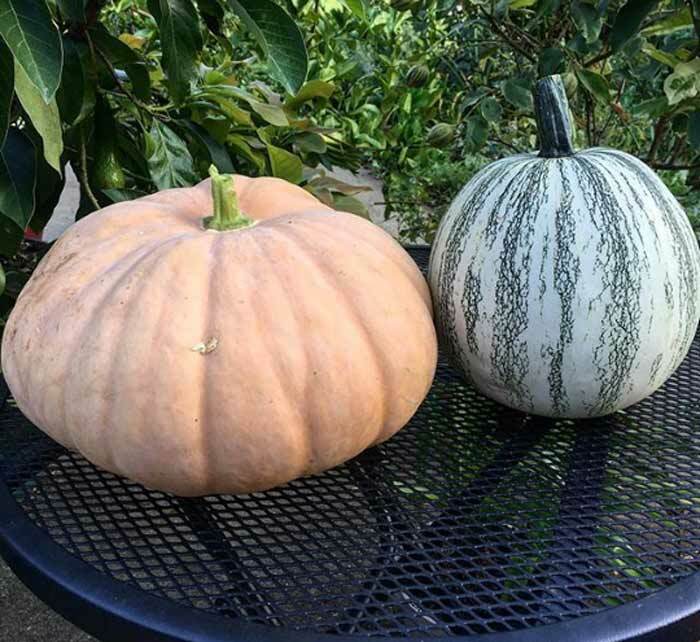 Right: Pipian from Tuxpan winter squash/pumpkin, a rare heirloom bred for its large edible seeds. Just as with tomatoes, different varieties of pumpkins offer different flavors. In fact, we grow some pumpkin varieties that are so sweet and nutty on their own, that no additional sugar is needed to turn them into pies! A pile of winter squash and pumpkins from our garden. Winter squash and pumpkins are virtually genetically identical members of the cucurbit family and easily cross-pollinate with each other. We also grow varieties of pumpkins that are bred to have especially delicious seeds. 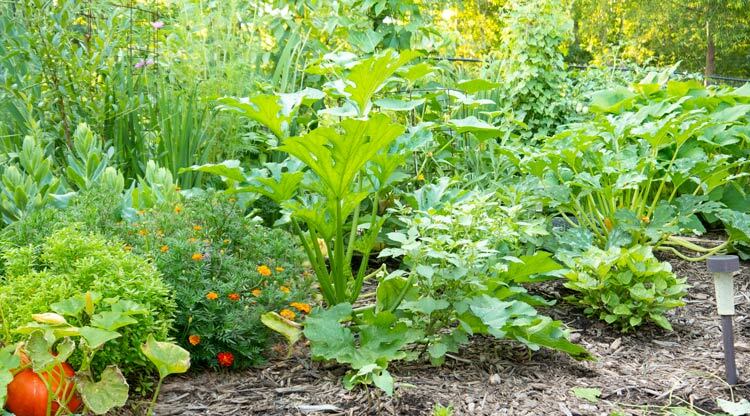 You might also want to grow your own pumpkins to ensure that they don’t contain any synthetic pesticides, and that they were grown in ways that nurtured the soil, rather than degrading it. 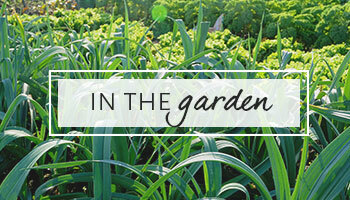 A garden can be home to an amazing amount of biodiversity. 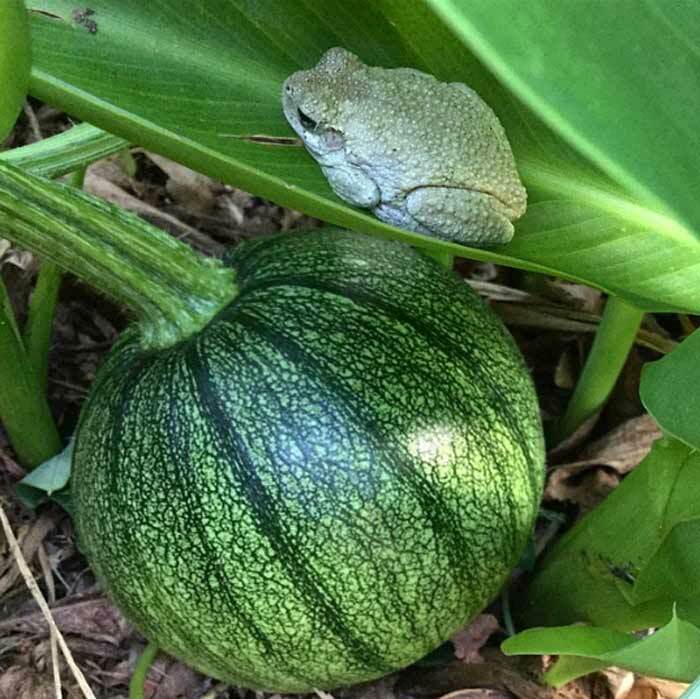 Here’s a tree frog hanging out about a baby pumpkin in our garden. Amphibians are especially susceptible to pesticides, which is one reason we never use them. Frogs also make a great addition to our integrated pest management team! This article is intended to be a guide to help you enjoy all the edible parts of your pumpkin, whether home-grown or store-bought. Hopefully, more Halloween pumpkins and jack-o-lanterns end up on dinner tables rather than in landfills! 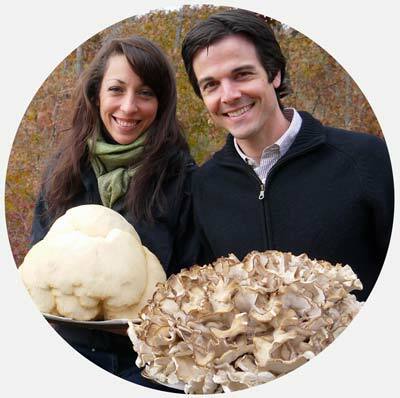 We love eating various types of flowers from our garden, many of which are amazing superfoods packed full of nutrition. Some of the largest and tastiest flowers we grow are edible pumpkin flowers. Pumpkin flowers have a sweet yet slightly earthy flavor. Since pumpkins, winter squash, and summer squash are all closely related cucurbits, we eat lots of their flowers throughout the summer. How do you eat pumpkin flowers? 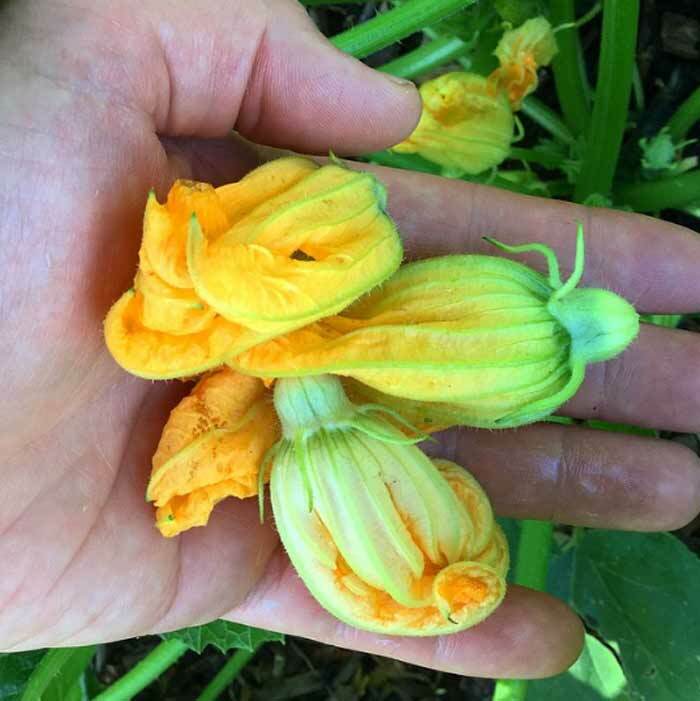 Handful of edible pumpkin flowers. 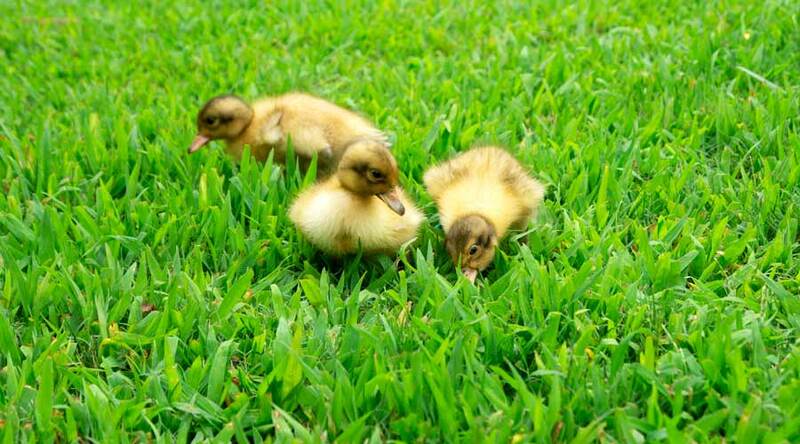 Nothing wrong with munching on these while you’re walking around the garden! Just make sure you open them up to take a peak inside first since bees can sometimes get trapped inside. 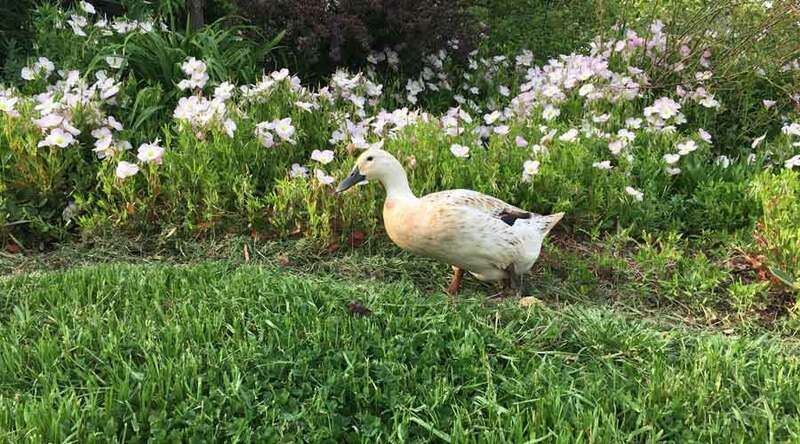 Sometimes we munch our pumpkin flowers straight off of the plant when we’re in the garden. Pumpkin flowers can also be added to salads, dipped in pancake batter and fried, or chopped and used as a garnish. Tip: If you want to eat pumpkin flowers and still get actual pumpkins, only eat the male pumpkin flowers! It’s easy to tell the male and female flowers apart once you’ve seen them both. 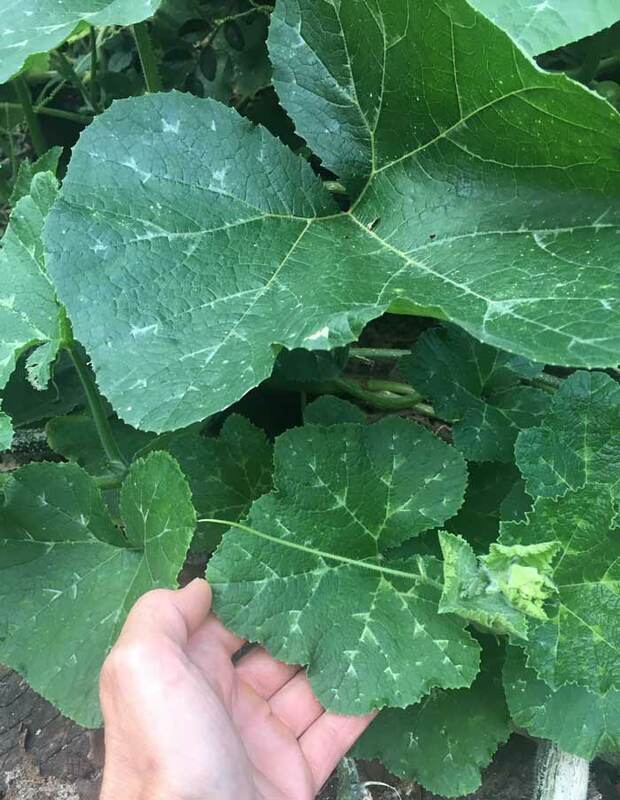 Female pumpkin flowers (right) have the immature fruit at the base that will eventually become the mature pumpkin. 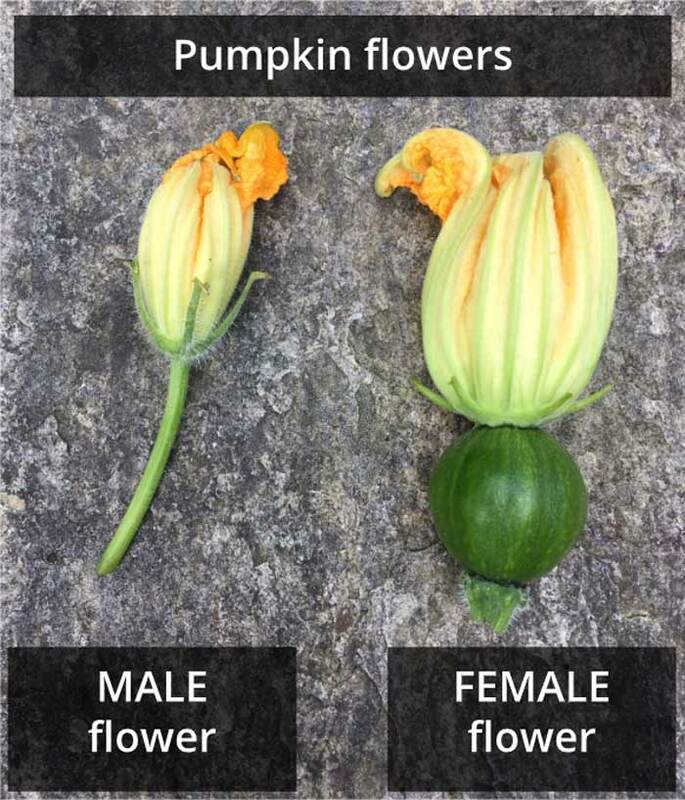 Male pumpkin flowers (left) do not. 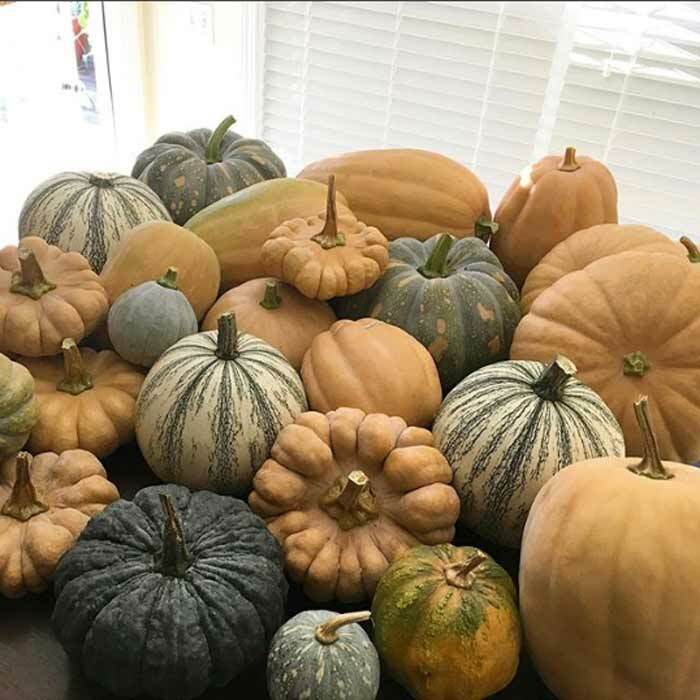 Pumpkins are “monoecious,” meaning a single plant will produce both male and female flowers, allowing it to reproduce without another pumpkin plant. Like other plants in the squash family, pumpkins always produce a good number of male flowers BEFORE they produce their first female flowers. This is done to attract pollinators to the plant before they put energy into producing female flowers. 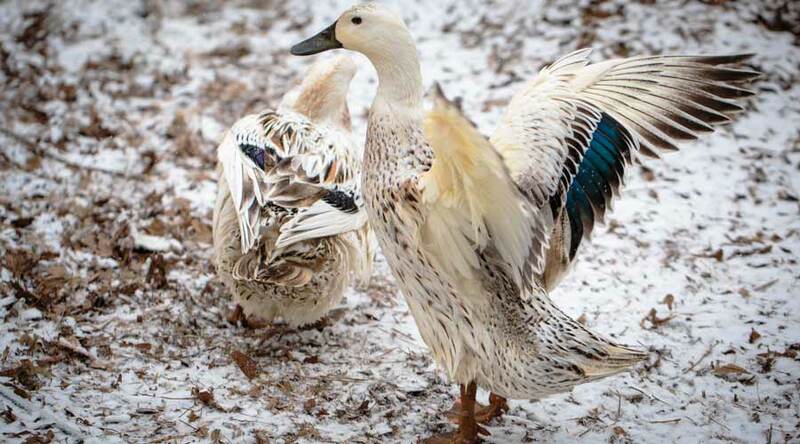 stuff them with goodies and fry them (here’s a good recipe). Funky! 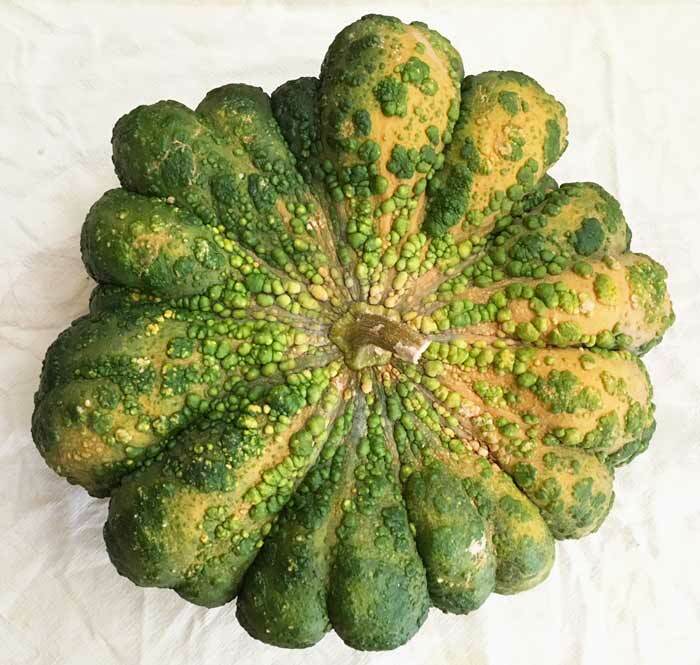 This giant, warty winter squash/pumpkin is the result of a few years of somewhat purposeful, somewhat accidental crossing between some of our favorite varieties. Our bees certainly helped us along the way! Yes, pumpkin leaves are edible too! In fact, they’re even considered a delicacy in parts of Asia. Pick the young-medium aged leaves (not the older tougher ones). Then use them in cooked recipes like you would spinach or a heavy winter green. Yes, pumpkin leaves are edible! 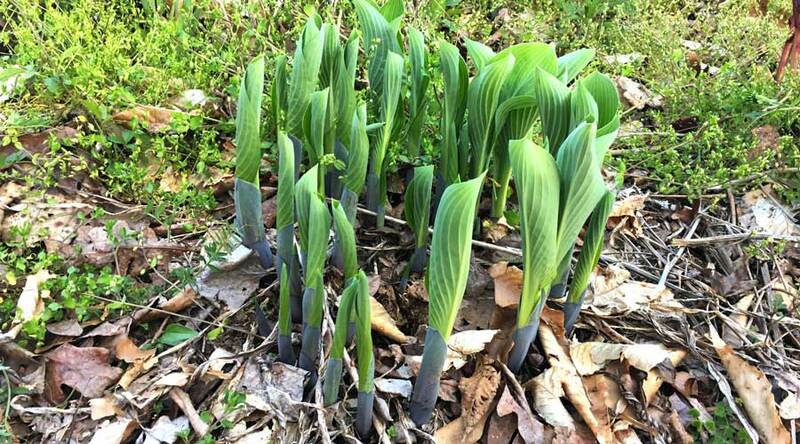 Here you can see pumpkin leaves at various ages. The younger leaves are best for eating (the ones my hand are on). The older leaves (above) will be tougher, but could be chopped for use in a baked dish or pickled and used to make stuffed wraps (like pickled grape leaves are used). We’re itching to make a pumpkin Spanakopita using both pumpkin leaves (in place of spinach) and pumkin flesh. Wok-frying pumpkin seeds on medium-high heat. Add a touch of high-heat oil, sea salt to taste, then cook until golden brown, turning frequently. Pumpkin seeds are a great source of protein, magnesium, copper, and zinc. The oils in pumpkin seeds are incredibly healthy for you, containing good fatty acids such as oleic acid and alpha-linolenic acid. 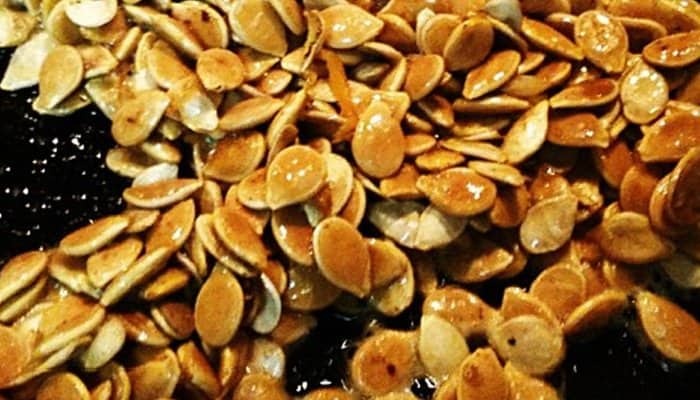 Perhaps the best pumpkin for edible pumpkin seeds is the Styrian pumpkin from Austria. 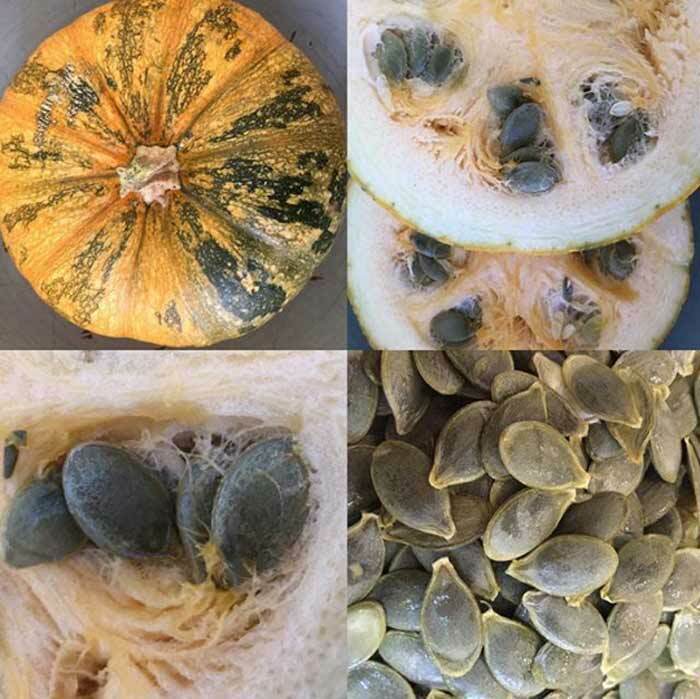 These offer hull-less seeds, unlike most pumpkins whose seeds have a fibrous hull. Slice open your pumpkin (to eat or to make as a jack-o-lantern). Heat a frying pan or wok on medium-high heat. Add enough high heat vegetable oil (we like organic sunflower, grapeseed, or raw coconut oil) to sauté them, depending on how many seeds you have. Once the pan is hot, add the pumpkin seeds. *Don’t worry if there is a little bit of pumpkin “guts” still attached, this cooks up fine and adds some nice flavor & nutrition. As soon as the seeds are in the pan, add some fresh ground sea salt. Stir repeatedly to ensure light, even browning uniformly on the seeds’ surfaces. Let them cool down, but eat them while they’re still warm for best flavor! 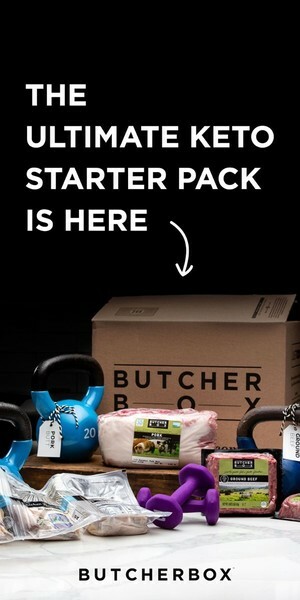 They’ll also store for a long time and make a great, healthy alternative to potato chips. Yum! We’re preparing to stick this green-skinned heirloom Jarrahdale pumpkin into the oven at Tyrant Farms. Pumpkin flesh is healthy, delicious, and versatile. It can be used in a seemingly infinite variety of dishes (or flavoring for various drinks). It’s also very easy to turn a large pumpkin into usable pumpkin puree, freezing enough to last until the next year. Turn your oven to Bake on 350 degrees. Cut your pumpkin into chunks small enough to fit on a baking sheet. 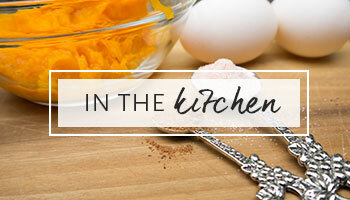 Cover the baking sheet with foil or parchment paper first so the pumpkin doesn’t stick when you bake it. Put the pumpkin chunks onto the baking sheet, skin side up/flesh side down, so that the pumpkin meat doesn’t get charred. Bake until the pumpkin flesh is soft (the amount of time it takes will vary depending on the size of your chunks and the type of pumpkin you’re using). A simple test to know when it’s done: you should be able to stick a fork through the biggest chunks of pumpkin without much effort. Put the pumpkin meat in a food processor and blend it until it’s smooth and chunk-free. 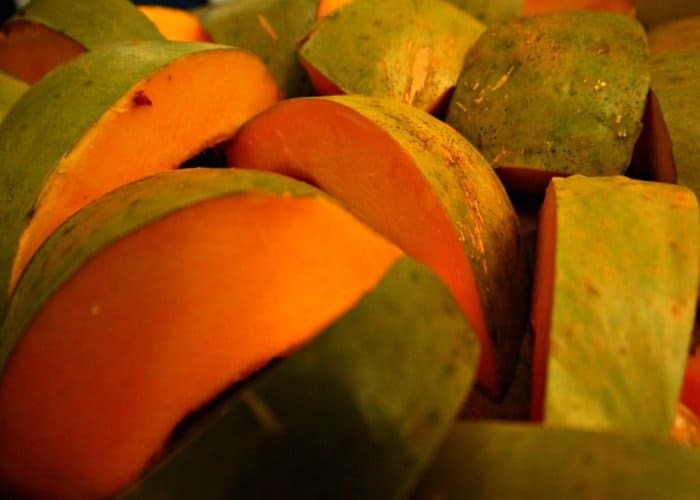 You now have fresh pumpkin puree that you can use immediately or freeze for later use in pies, puddings, breads, soups, pumpkin spice pancakes, and many other dishes. Pumpkins come in all different sizes and colors, not just round and orange. We hope you enjoy all parts of your incredible, edible pumpkin. Remember, if you grow your own pumpkins, you can select unusual varieties for their unique culinary qualities AND eat the flowers and leaves as they grow!